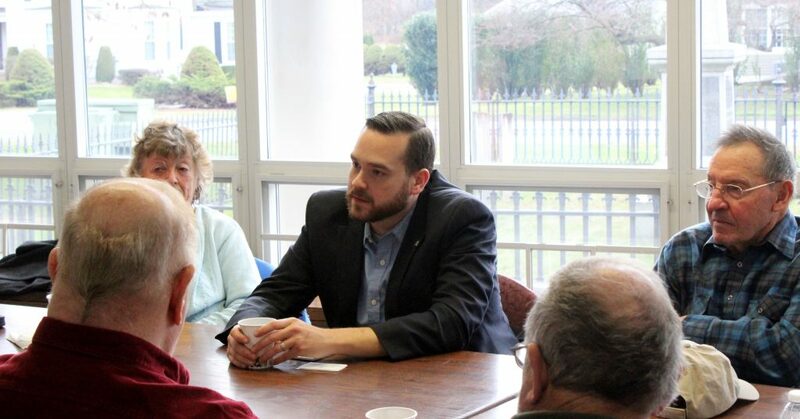 ELLINGTON – State Rep. Christopher Davis spoke to veterans at the monthly Veterans’ Coffee House Meeting on Thursday. Rep. Davis talked about topics and issues concerning the state and answered a variety of questions ranging from veterans’ benefits to tolls. The Veterans’ Coffee House is a program in Ellington, which brings all veterans together in a comfortable setting to meet, socialize, seek and share information on their military experiences, learn about local and State Veteran’s benefits and services and to enjoy a cup of coffee.